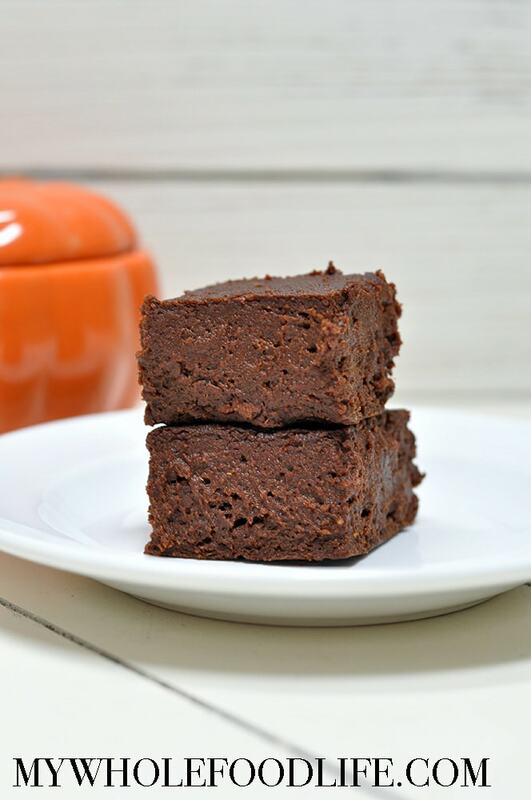 These brownies would be delicious with some ice cream or coconut whip cream on top. Or you could drizzle some extra nut butter on top. Yum! Want to make this recipe? Watch the video below. For more recipes, you can subscribe to my You Tube Channel. 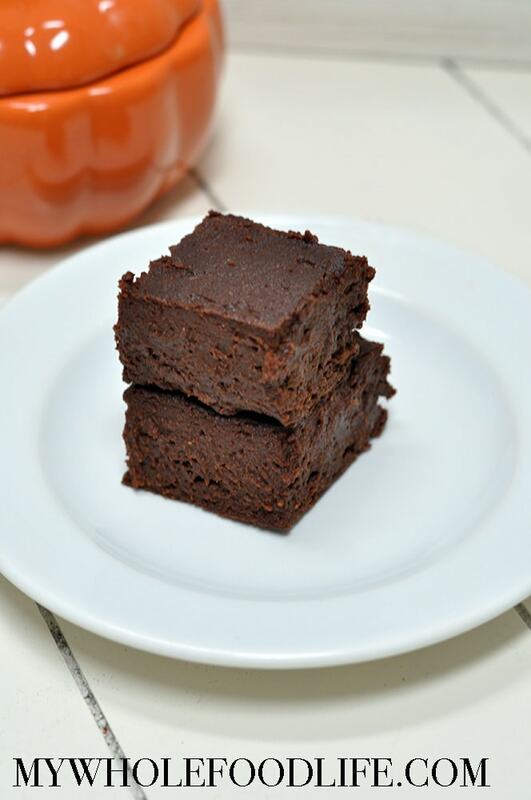 These super rich flourless pumpkin brownies are big on flavor. Vegan, gluten free and grain free too! In a food processor , add all the ingredients. Blend until smooth. Pour batter into the loaf pan . Let cool before removing from pan and cutting. These should keep in the fridge for 2 weeks. You can also freeze them for longer. Enjoy! Made these tonight. Yum! My kids loved them. I used truvia to cut carbs and added sugar free chocolate chips. They were a rich, delicious brownie. Thank you!! How much trivia did you use? Would you have to use a nut butter, or would regular butter work too, do you think? I ended up using almond butter. They were fantastic!! Thank you! Okay great!! Glad you liked them! I think regular butter would just melt and not have enough substance to hold up as a brownie. I didn't try it but that's what I think. I used peanut butter. Nice thick consistancy going in the pan. They are still in the oven so don't have the final verdict yet. Mine turned out all smooshy.... it stayed pastey... any hints or tips??? You can not tell me that if you ran a toothpick through the batch made for the photo on this page, it would come out clean. I made these and waited till a clean toothpick extraction and it came out rather dry, 28 mins, and certainly had no moisture the next day. I'll make them one more time to test a lesser time, more like 15-20 mins tops. Besides dry, I think this is a tasty recipe. Sorry they were to dry for you. :( I do know oven temps can vary. Also, are you at a high altitude? That may effect baking. To lessen the amount of sugar... Could I use half apple sauce and half sugar? Or any other ideas? Not a fan of super sweet. Thank you!! These are definitely not super sweet. Adding applesauce will make them too wet since the sugar is granulated. You could maybe do a little more nut butter and less sugar? Just a guess. I'm not sure if it will work for sure. These are amazing! Nice and fudgy and not too sweet! I put in an 8 x 8 glass pan, sprinkled a few chocolate chips on top and baked for about 25 minutes. These freeze well too. They defrost nicely on the counter or in the microwave for just a few seconds. Thanks so much for the recipe. Yay!! So glad you liked them Holly! You can try. It may work too. Can you use monk fruit sweetener instead of coconut sugar?